A little update for the Ludumdare community about pygame. Over the last many months a bunch of us has slowly been toiling away at pygame. Remember pygame? It’s an SDL for python, but with a pythonic API. Seven years or so worth of changes in this little release. What’s changed? Even I don’t know really. Sort of lots, and sort of not much. I’ve been meaning to write a series of blog posts describing things, and will eventually. But one thing is that it integrates nicely with the python package manager. Meaning games can be distributed to tens of millions of python users with a `pip install yourgame`. We’ve also been experimenting, and working on other packaging tools. Like windows installers, linux installers, and zero configuration packaging amongst other topics. Alongside this work has been trying to raise awareness within the python community, that yes, game developers and artists actually exist who use python. We’re still here. Plus there’s a new website (well, it’s still in beta testing, but probably will replace the old one any day now). Well, it’s more a continuation of the old websites. It’s been an act of slowly migrating old content (the earliest files are from the year 2000). Like all the cool kids, we’re moving to github.com/pygame (fashionably late as usual). As someone once said Punk’s not dead(and neither is pygame). Is python good for game development? Why or why not? Are there any tools or libraries you would recommend? 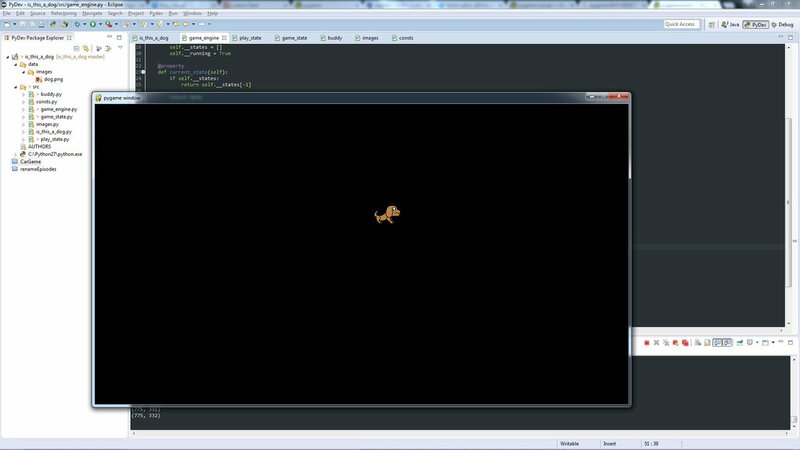 Have you used python for game development in the past, and do you currently? Right now my impression is that, as python is a high level language, it is slower for memory intensive games. If I continue with game development, I would probably switch to another language. So far I haven’t had any problems with it, because I’ve been programming pretty simplistic 2D games. Any feedback would be appreciated, thanks in advance. Hello, I’m new to Ludum Dare (and game development), so I’m entering the Mini LD #69 to see if I can create a game. I’m using python3 and pygame as well as PyCharm for my IDE. I’ve been programming for a 4 or 5 years and got interested in game development. Any tips for Ludum Dare, game development, or python would be appreciated. Thanks! We have fixed the positioning bug on obstacles and enemies in v1.1. After these three (hards) days here is our submission for the Ludum Dare 35!! The game name is “Is this a dog?”. The main plot is that you are a sorcerer who is testing his last invention a sheep”dog” for monsters! You need to teach him to park the monsters in their respectives portals before they reach the sheep”dog”. There is no ending in the game, the goal is simply to reach the higher score you can ! The mouse cursor is the hand. As this is our first Ludum Dare, we would love any returns you have !! We have made some progress on the dev of our game “Is this a dog?” and we would like to share it with you. The goal as not changed since last time. You control the hand of a sorcerer and you have to keep its pet safe. The pet will always follow the hand and can be shifted into different animals. Progress on Is this a dog? You are a sorcerer who is testing his last invention: a sheepdog for monsters. The sheepdog is not entirely functional, so you have to help him by moving your omnipresent hand to lead him. But be aware your sheepdog cannot attack the monsters! This is not my first participation in a game jam, but this is the first time I participate to Ludum Dare. All my fellows are complete newbies but they are full of motivation! Python is super easy! During Ludum Dare I instantly knew how to go from my idea to a prototype. Code for dev mode I used to test different functions. Simple! Problems with easy but annoying solutions. I wrote my game in Python/Pygame, which generally, I can’t say enough good things about. I did a cx_freeze of my game, which should collect any dependences and wrap the python code into an executable. For some reason Pygame’s extended image support is sometimes not working. I think there may be some SDL libraries or some other thing that are required, but I’m not sure why there not getting bundled in the freeze. Pygame people, any ideas? Until I can fix the actual problem, I converted all the PNG files into BMPs, which is the default format that works even with the extended image module. The zip file is a little bigger, but it should work for everyone. Actually, this is such an easy and reliable “fix” that there is a 42% chance that I will never get around to figuring out the actual problem. TL;DR — The Linux build wasn’t working for some people, but now it should work for all x such that x uses Linux. as well as the super graphics machine that is Microsoft Powerpoint, and for music, well, umm, I’ll just shout down a microphone. I figured I’d do a brief blog post about my first experience with Ludum Dare. I didn’t do any posts during, as I was focused on the game and didn’t know how much time I’d need. You can find my game post here. This document is formatted by putting the general more easily accessible things first, and then moving onto items that you may or may not care about. I’ll start off by explaining my game a little bit, then I’ll talk about my experiences, and then finally with the development, starting with general game development ideas and then with the more technical aspects that I thought were interesting. Warning, this document is largely unedited. I am also not generally a game developer, so I may find simple things about the process interesting. Although I may of been inspired, at a later point by this video, the genesis of my idea came about from thinking about the fugue form. Each level is supposedly a day (you can think of it as any unit of time though), you are limited to a certain amount of moves to complete a puzzle in a given timespan. In this game I made each turn take one hour of in-game time. The twist, is that you have several “lives” that you can live out. At the end of each day, it resets and you get to start anew. However, this time your past self (called an Echo) does the same thing, and you can do new things. Technically, you can have an infinite amount of Echoes, but to keep the game interesting and difficult, each level limits the maximum amount of lives. If you haven’t tried out, I’d suggest it. The reviews seem to indicate that people enjoyed the main puzzle mechanic. Making an attempt to be in. Coming out of a really rough work week, I managed to sleep for about ten hours and I still feel horrid… but I’m gonna try to create something this weekend! Still just starting out with the idea phase, but I’ll probably work on a rogue-like using Python/Pygame. Great success for all!